Lock in a great price for Nineteen 06 Mission – rated 9 by recent guests! We like the staff, they was very kind and professional and helpfull, the room was very comfortably, the bathroom very clean, the breakfast on time and delicious. If we go back to San Francisco we gonna stay again in this hotel. It was in an interesting neighborhood but the inside was amazing and it was in close proximity to the bart which was nice. The staff was super friendly and everything was clean. It's a great location with restaurants, bars and shops on Valencia and further down Mission. The bed was comfortable and warm and the room included a noise machine and ear plugs which helped a lot with the noise. Updated interiors and courtyards made this a nice experience. Would stay again. Lovely welcome (even though my plane was delayed and I arrived late!) and shown to my great room. Works perfectly for 1-2 people. I was worried about the shared bathrooms but there is always one free, they're large and impeccably clean. Also, there's always some tea/coffee and cookies put if you're peckish. My boyfriend and I booked a double room for a 7-nights-stay. We were a little bit concerned regarding the shared-bathroom-situation. Luckily it turned out very good. We had no problem with sharing a bathroom. The facilities were always clean and most of the time not even occupied. The rooms are small but cozy and if you visit SF for sightseeing and exploring the city you get all you need here. We didn`t spend a lot of time in the hotel but when we did there were no negative impressions. The location is only a few minutes away from the BART station and you can get easily around. Nineteen Mission 06 provides fresh towels and shampoo/shower gel. Hair dryers upon request (also absolutley no problem to get them at the reception). We arrived early and were able to check-in right away - super convenient!! The BnB was very clean. The staff was very friendly. Accomodations were nice. Our cable was not working in our room, luckily they were able to allow us to switch rooms which was great. Nineteen 06 Mission This rating is a reflection of how the property compares to the industry standard when it comes to price, facilities and services available. It's based on a self-evaluation by the property. Use this rating to help choose your stay! Providing a daily continental breakfast, this San Francisco bed and breakfast features a modern, environmentally conscious design. Free Wi-Fi access is available in the shared lounge. Each room is designed with the environment in mind: energy efficient lighting, re-purposed building materials and free organic toiletries are provided. A flat-screen TV and air conditioning are featured in each bright room at 1906 Mission San Francisco. The shared bathrooms provide a hairdryer and free toiletries. Energy efficient lighting, organic toiletries, and earth-friendly amenities are some of the eco-friendly initiatives taken by the property. A terrace and a shared lounge area are on site. 1906 Mission San Francisco is a 3-minute drive from San Francisco City Hall and a 15-minute drive from the Golden Gate Bridge. A number of dining options are accessible within a 10-minute walk of the property. 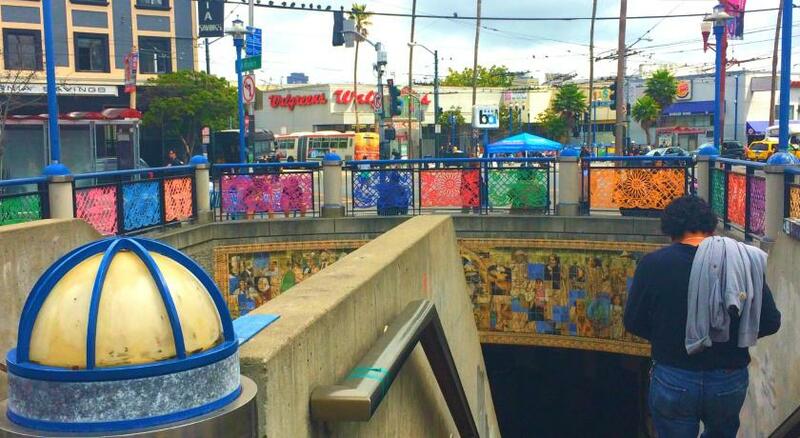 16th Street Mission BART Metro Station is a 2-minute walk away. The B&B is 13 miles from San Francisco International Airport. Mission is a great choice for travelers interested in culture, city walks and restaurants. When would you like to stay at Nineteen 06 Mission? This room is designed with the environment in mind: energy efficient lighting, re-purposed building materials and free organic toiletries are provided. Access to a shared bathroom is included. This room offers a bay window with bench, a queen bed with a custom made headboard with lighting, USB ports and a flat-screen cable TV. 1906 Mission wants to be your home away from home. The clean, simple yet tasteful decor along with the small touches such as the daily fresh fruit infused water, help make this a relaxing and enjoyable retreat. House Rules Nineteen 06 Mission takes special requests – add in the next step! One child from 3 to 12 years is charged USD 20 per person per night when using existing beds. One child from 3 to 12 years is charged USD 25 per person per night in an extra bed. Nineteen 06 Mission accepts these cards and reserves the right to temporarily hold an amount prior to arrival. Paid parking is located nearby. Contact the property directly for details. Extra beds are very limited in availability. Please contact the property in advance if you need an extra bed. Please inform Nineteen 06 Mission of your expected arrival time in advance. You can use the Special Requests box when booking, or contact the property directly using the contact details in your confirmation. Very clean, well maintained and secure. When the people walk you can hear the steps. There is a slight odour in the place. I’m not sure if it is because of mold. The only downside for me, it's the situation near a lot of street people. when you are just a girl by night, it was a litle scary, but we don't have any problem with them. Everything was great from start to finish. The breakfast was a great way to kick start the day with coffee, muffins, fruit, juice etc. We found this was enough to starts the day with and sometimes we would get more after we left. The place felt secure with key card locks for all rooms. Bathrooms were sometimes all used up, but it was only a couple of minutes until one was free. The cleanliness and facilities in the bathrooms were great. Shampoo, conditioner and body wash was provided. Towells were always clean and stocked up also. The staff were chatty and helpful - we often asked for advce on how to get to places and what to do etc, and they are more than happy to provide a hair dryer free of charge. Location; The Mission district is thriving and has a lot of personality compared to other areas of San Francisco; great places to eat and good bars on the main streets. We got uber pretty much everywhere whilst we were there - they are the same price as public transport and a lot quicker. There are quite some homeless people around which can be a depressing. I didn’t encounter any problems though. It’s really well connected though. The shared bathrooms don’t get cleaned during the evenings and nights. Considering that it was pretty clean though. The staff was so friendly and helpful. This was really special about the stay. The room was really nice and clean. Maybe a bit dark, but I hardly stayed in the room during daytime anyways. The area is very eclectic and has a large homeless population. However, they mean no harm to anybody, but I can understand how some people may feel unsafe because of this. All of the staff were amazing, friendly and accommodating. I cannot rate the customer service from this place highly enough! The buffet breakfast was small but perfect to start the day with. Perfect central location to be based from, away from the hustle and bustle of the main tourist spots, but easily accessible from a BART station a block away and regular buses. Don't let the shared bathroom facilities put you off booking here. Always very clean, minimal waiting times for the facilities. They also provided large umbrellas for use by hotel guest to use whilst the area experiences rain (which isn't thay often!) I will definitely stay here again. I stayed around 10 days. There are several homeless people just outside the property. On the weekend the number of homeless people increases a lot as some event just happens across the street. The location is good; very close to the BART on 16th Mission. Staff is friendly and the price is fair. The beds were uncomfortable and the room was a bit loud. Wonderful b&b in a great part of town, a block from Valencia St for great shopping and restaurants. Immaculately clean & great customer service!